On this date in 1961 Kuwait ended its treaties with the United Kingdom and declared independence. Kuwait is a constitutional monarchy with a parliamentary system of government. Kuwait City is the country’s political and economic capital. The nation has the most liberal political system in the GCC (union of Gulf states). It has the fifth largest oil reserves in the world, and is, therefore, economically stable despite the devastation of its infrastructure in the Gulf War. For almost all of its history Kuwait was a maritime and mercantile hub because of its strategic location. Kuwait was historically part of the general region of Mesopotamia, with the archeological record beginning in the Ubaid period (ca. 6500 BCE). The world’s oldest reed-boat was discovered in Kuwait in the north establishing the fact that Kuwait has for most of its long history been a maritime nation, and one of the oldest, most continuous in the world. Mesopotamians first settled in the Kuwaiti islands of Akkaz and Failaka in 2000 BCE. Traders from the Sumerian city of Ur settled in Failaka and ran a mercantile business. The island had many Mesopotamian-style buildings typical of those found in Iraq dating from around 2000 B.C. These Neolithic inhabitants of Kuwait were among the world’s earliest maritime traders. The earliest recorded mention of Kuwait was in 150 CE in the geographical treatise Geography by the scholar Ptolemy. Ptolemy visited the area on the orders of Alexander the Great; he called the Bay of Kuwait Hieros Kolpos (Holy Bay). In 4000 BCE until 2000 BCE, the Bay of Kuwait was home to the Dilmun civilization. Dilmun’s control of the bay of Kuwait included Kuwait City’s Shuwaikh Port (formerly Akkaz Island), Umm an Namil Island, and Failaka island. At its peak around 2000 BCE, the Dilmun empire controlled the trade routes from Mesopotamia to India and the Indus Valley civilization. 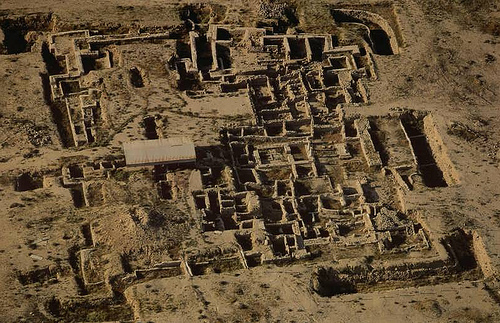 The commercial power of the Dilmun civilization began to decline after 1800 BCE. Piracy flourished throughout the region during Dilmun’s decline. After 600 BCE, the Babylonians added Dilmun to their empire. Following the Dilmun civilization, the bay of Kuwait was inhabited by the Kassites of Mesopotamia, and was formally under the control of the Kassite dynasty of Babylon. Under Nebuchadnezzar II (of Biblical fame), the bay of Kuwait was under Babylonian control. Cuneiform documents found in Kuwait’s islands indicate the presence of Babylonians in the island’s population, and Babylonian kings visited some of Kuwait’s islands during the Neo-Babylonian Empire period, Nabonidus had a governor in Failaka and Nebuchadnezzar II had a palace and temple in Falaika.The island of Failaka also contained temples dedicated to the worship of Shamash, the sun god in the Babylonian pantheon. In 3rd century BCE, the ancient Greeks colonized the Bay of Kuwait under Alexander the Great, the ancient Greeks named mainland Kuwait Larissa and the island of Failaka was named Ikaros. According to Strabo and Arrian, Alexander the Great named Failaka Ikaros because it resembled the Aegean island of that name in size and shape. Remains of Greek colonization include a large Hellenistic fort and two Greek temples. In 127 BCE, the kingdom of Characene was founded around southern Iraq and the bay of Kuwait. Characene was located roughly within the borders of modern Kuwait. A busy Characene commercial station existed within Kuwait. Characene’s capital was Charax Spasinou. The city of Charax was originally in the coast of the Persian Gulf in modern-day Kuwait. The city was an important port in the trade from Mesopotamia to India and provided port facilities for the great city of Susa, further up the Tigris River. Trajan, the Roman emperor, visited Charax in 116 CE, during his invasion of Parthia, and watched the ships leaving for India. In 636 CE, the Battle of Chains between the Sassanid Empire and Rashidun Caliphate was fought in Kuwait near the town of Kazma. As a result of the Rashidun victory in the seventh century, an early Islamic settlement known as Kazima was founded in Kuwait, and Kuwait was known as Kazima for many centuries. In 1613, the town of Kuwait was founded in the heart of modern-day Kuwait City. In 1716, the Bani Utubs settled in Kuwait. At the time of the arrival of the Utubs, Kuwait was inhabited by a few fishermen and primarily functioned as a fishing village. In the 18th century, Kuwait prospered and rapidly became the principal commercial center for the transit of goods between India, Muscat, Baghdad and Arabia. By the mid-18th century Kuwait had already established itself as the major trading route from the Persian Gulf to Aleppo. During the Persian siege of Basra in 1775—1779, Iraqi merchants took refuge in Kuwait and were partly instrumental in the expansion of Kuwait’s boat-building and trading activities. As a result, Kuwait’s maritime commerce boomed. Between the years 1775 and 1779, the Indian trade routes with Baghdad, Aleppo, Smyrna and Constantinople were diverted to Kuwait. The East India Company was diverted to Kuwait in 1792. The East India Company secured the sea routes between Kuwait, India and the east coasts of Africa. This allowed Kuwaiti vessels to venture all the way to the pearling banks of Sri Lanka and trade goods with India and East Africa. Kuwait was also the center for all caravans carrying goods between Basra, Baghdad and Aleppo during 1775-1779. Kuwait’s strategic location and regional geopolitical turbulence helped foster economic prosperity in Kuwait in the second half of the 18th century. Kuwait became wealthy due to Basra’s instability in the late 18th century. In the late 18th century, Kuwait partly functioned as a haven for Basra’s merchants fleeing Ottoman government persecution. Economic prosperity in the late 18th century attracted many immigrants from Iran and Iraq to Kuwait. By 1800, it was estimated that Kuwait’s sea trade reached 16 million Bombay rupees, a substantial amount at that time. Kuwait’s pre-oil population was ethnically diverse, including Arabs, Persians, Africans of various ethnicities, Jews, Armenians, and others. Kuwait was the center of boat building in the Gulf region. Ships made in Kuwait carried the bulk of international trade between the trade ports of India, East Africa, and Red Sea. Boats made in Kuwait were capable of sailing to China. 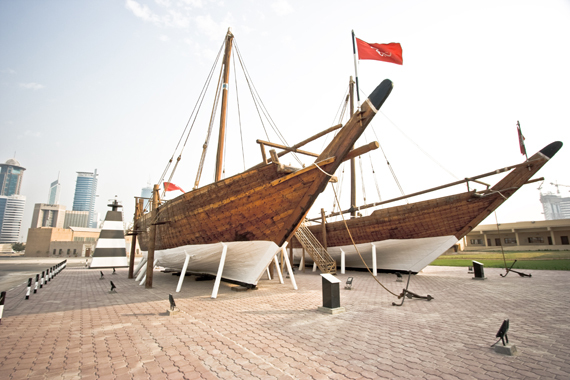 Kuwaiti vessels were renowned throughout the Indian Ocean for quality and design. 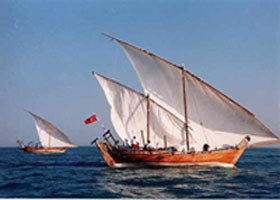 Kuwaitis also developed a reputation as the best sailors in the Persian Gulf. Kuwait was the Marseilles of the Persian Gulf. Its population was good natured, mixed, and vicious. As it was the outlet from the north to the Gulf and hence to the Indies, merchants from Bombay and Tehran, Indians, Persians, Syrians from Aleppo and Damascus, Armenians, Turks and Jews, traders from all the East, and some Europeans came to Kuwait. From Kuwait, the caravans set out for Central Arabia and for Syria. In the first decades of the twentieth century, Kuwait had a well-established elite: wealthy trading families who were linked by marriage and shared economic interests. The elite were long-settled, urban, Sunni families, the majority of which claim descent from the original 30 Bani Utubi families. The wealthiest families were trade merchants who acquired their wealth from long-distance commerce, shipbuilding and pearling. They were a cosmopolitan elite who traveled extensively to India, Africa and Europe and educated their sons abroad more than any other Gulf Arab elite. Western visitors noted that the Kuwaiti elite used European office systems, typewriters and followed European culture with curiosity. 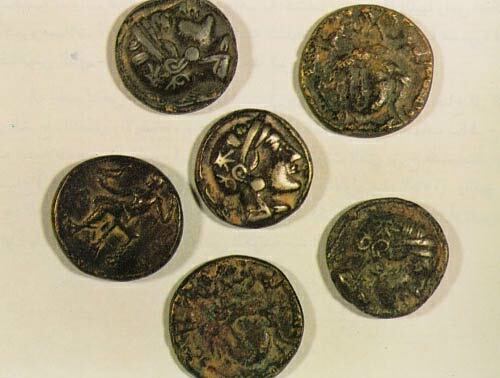 The richest families were involved in general trade. The merchant families of Al-Ghanim and Al-Hamad were estimated to be worth millions before the 1940s. In the early 20th century, Kuwait declined significantly in regional economic importance, mainly due to trade blockades and the world economic depression. During World War I, the British Empire imposed a trade blockade against Kuwait because Kuwait’s ruler supported the Ottoman Empire. The British economic blockade heavily damaged Kuwait’s economy. 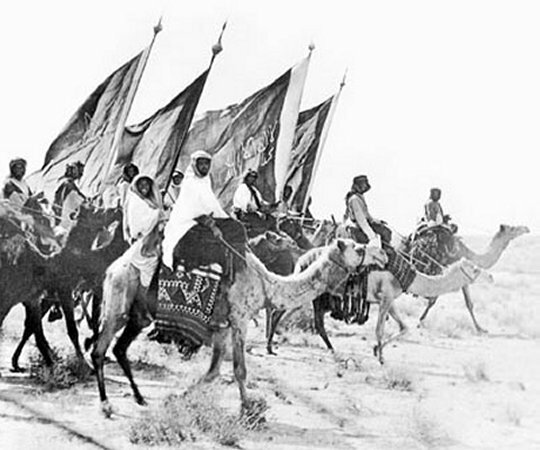 The Kuwait-Najd War erupted in the aftermath of World War I, when the Ottoman Empire was defeated and the British invalidated the Anglo-Ottoman Convention, declaring Kuwait to be an “independent sheikhdom under British protectorate.” The power vacuum, left by the fall of the Ottomans, sharpened the conflict between Kuwait and Najd (nomadic Arab militia under the control of Ibn Saud). The war resulted in sporadic border clashes throughout 1919-1920. The border of the Najd and Kuwait was finally established by the Uqair Protocol of 1922. Kuwait was not permitted any role in the Uqair agreement the British and Al Saud decided modern-day Kuwait’s borders. Kuwait lost more than two-thirds of its territory because of the agreement. After the Uqair agreement, relations between Kuwait and Najd remained hostile. Kuwait remained subjected to a Saudi economic blockade and intermittent Saudi raiding. The Great Depression negatively impacted Kuwait’s economy starting in the late 1920s because international trading was one of Kuwait’s main sources of income before oil. Kuwaiti merchants were mostly intermediary merchants. As a result of European decline of demand for goods from India and Africa, the economy of Kuwait suffered. The decline in international trade resulted in an increase in gold smuggling by Kuwaiti ships to India. A few Kuwaiti merchant families became rich due to gold smuggling to India, but the majority was impoverished. Kuwait’s pearling industry also collapsed as a result of the worldwide economic depression. At its height, Kuwait’s pearling industry led the world’s luxury market, regularly sending out between 750 and 800 ships to meet the European elite’s need for pearls. During the economic depression, luxuries like pearls were in little demand. The Japanese invention of cultured pearls also contributed to the collapse of Kuwait’s pearling industry. 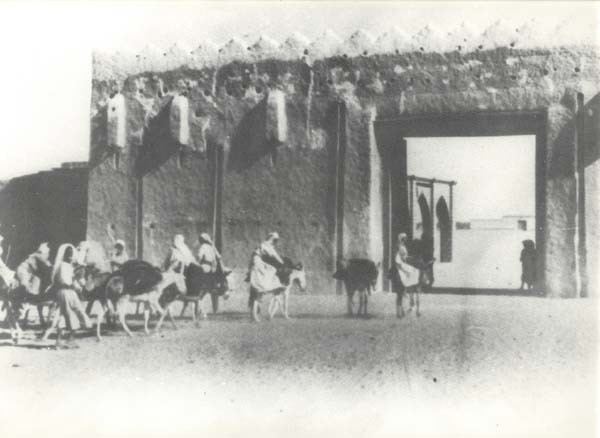 Some prominent merchant families left Kuwait in the early 1930s due to economic hardship. At the time of the discovery of oil in 1937, most of Kuwait’s inhabitants were poor. In 1937, the 15 year trade blockades against Kuwait were lifted and Kuwait’s large oil reserves were discovered by the US-British Kuwait Oil Company. Exploration was delayed until after World War II; the use of oil only began in 1951. In consequence a major public-work program began, enabling Kuwaitis to enjoy a better standard of living. By 1952, the country became the largest exporter of oil in the Persian Gulf region. This massive growth attracted many foreign workers, especially from India. 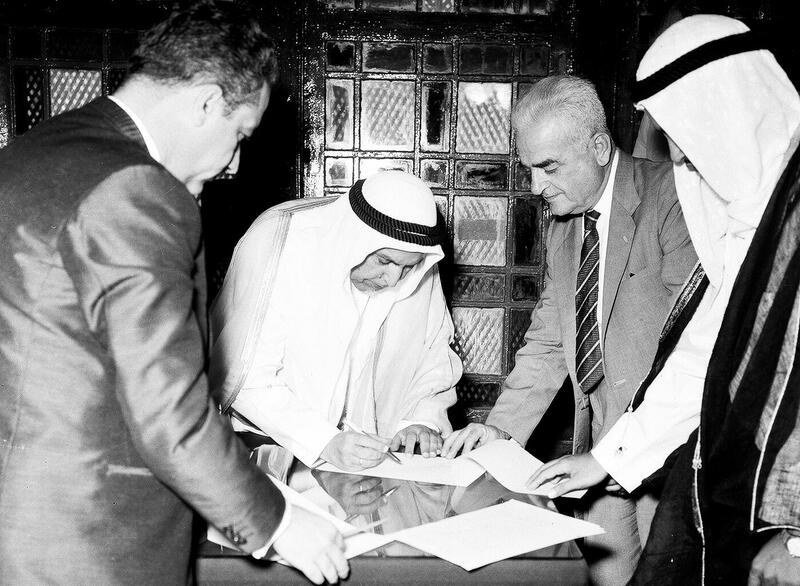 On 19 June 1961, Kuwait became independent with the end of the British protectorate; the sheikh Abdullah III Al-Salim Al-Sabah, became an emir, and the country joined the Arab League. On 10 November 2012, Kuwait marked the golden jubilee of its constitution with a spectacular KD 4.06-million ($15-million) fireworks display, featuring 77,282 fireworks – the largest firework display in history. Being an historically maritime nation, fish and other seafood are major components of Kuwaiti cuisine. The main fish eaten by Kuwaitis is the Zobaidi. The Hamour (grouper) is also important, typically served grilled, fried, or in Biryani (rice based curried dish). It has thick flesh and a distinctive taste. Other popular local fish include Safi (rabbitfish), Chanad, and Sobaity (sea bream). Most of the time, fish is eaten with rice. Kuwaiti cuisine is a blend of Indian, Persian, Mediterranean, and Najdi cuisines. A prominent dish in Kuwait is Machboos, a rice-based dish made with spices, rice (usually basmati) and chicken, mutton, fish, eggs, or vegetables. 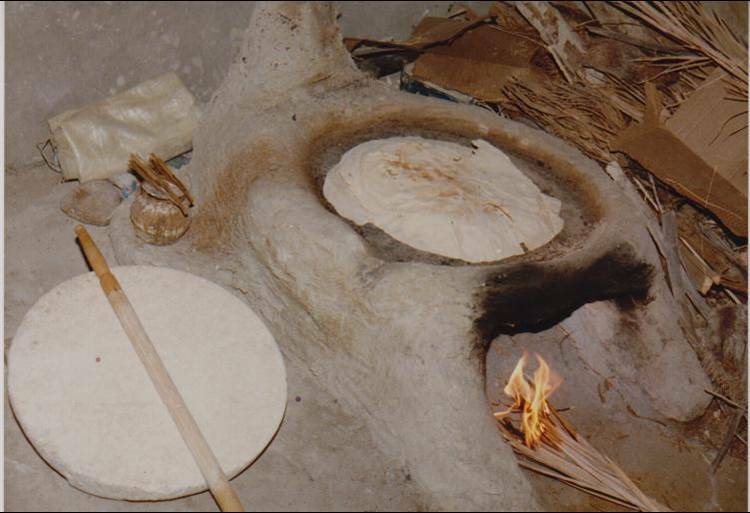 Kuwait’s traditional flatbread is Khubz, found throughout the Gulf region. It is a large flatbread baked in a special oven. Numerous Khubz bakeries dot the country. 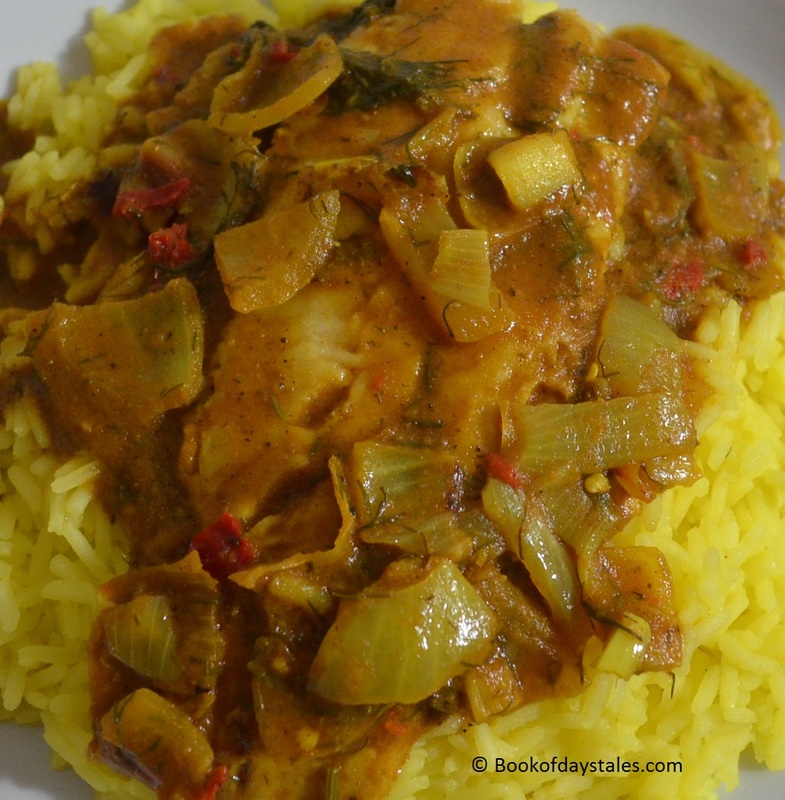 Here is a traditional Kuwaiti fish curry. Apart from the local fish, the ingredient that makes this dish special is the black lime. Black limes are not actually black, more a mottled tan. They are regular limes that have been partially dried and fermented, adding a complex sour note. You can find black lime in powdered form online; otherwise use regular limes. Mix together the ground spices and salt. Pierce the limes 4-5 times with a skewer. Sauté the onions in the vegetable oil in a large pot until they are translucent. Add the garlic, hot pepper, dill, cilantro, tomatoes, tomato paste, black limes and 2 teaspoons of the spice mix. Add 2 cups of water, stir, cover, and keep warm while preparing fish. Sprinkle the remaining spice mixture on both sides of fish and dust with flour. Fry lightly on both sides until golden. Transfer the fish to the stewing pot. Add more water if needed to cover fish. Simmer gently for 15-20 minutes until fish is done. Do not overcook the fish. Serve with basmati rice and flatbread.